Who's in it? : I'm kind of shocked that people like Duane Jones and Judith O'Dea didn't go on to do other things, but they didn't. So, no one you know unless you know them from this. What's it about? : A small group of people hole up in a farmhouse for safety against a ghoul attack. How is it? : George Romero is on record as saying he was heavily inspired by Carnival of Souls when he made this and it shows. Night of the Living Dead has that same sparseness that makes everything feel lonely and surreal. It creates unease and increases the sense that anything can happen. 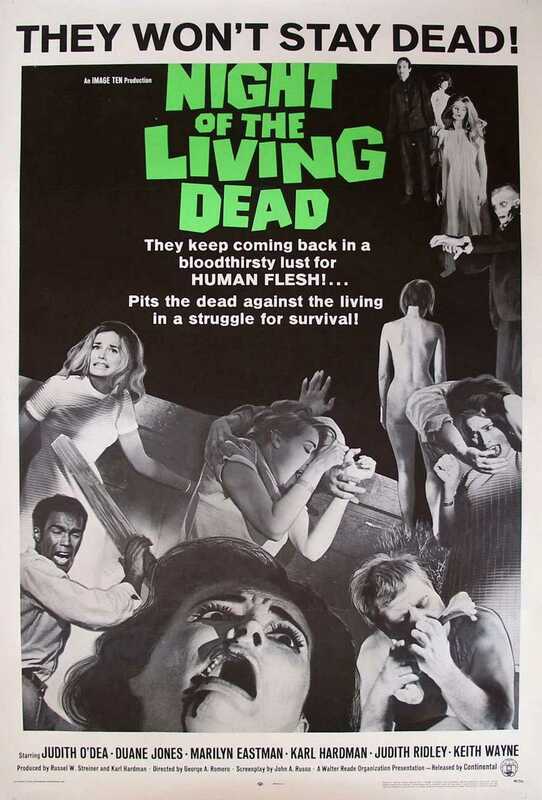 It spawned countless sequels, remakes, and rip-offs, but Night of the Living Dead isn't a typical zombie movie. In fact, the walking corpses are never called zombies in the film. News reporters call them ghouls, but the main characters mostly refer to them as "those things." There's also surprisingly little gore in the design of the creatures themselves, something else Romero borrowed from Carnival of Souls. They get their creepiness by being pale and shambling, not by having open wounds and spilling guts. There's gore in Night of the Living Dead, but it's reserved mostly for scenes of the zombies' eating people. That's where the real shocks of the movie occur. It's because it's an atypical zombie movie that I love it like I do. I don't find gore scary, but I do shiver at the sight of soulless, dead people shuffling around. That's why I tend to prefer voodoo zombies to the ones inspired by Romero. The cannibalism in Night of the Living Dead is gross, but it's really just there to give a consequence to being caught by the already horrifying creatures. The movie doesn't spend a lot of time on zombie dining, because it doesn't need to. It's already plenty scary. Monster movies are made or broken by their casts of victims though, and that's another place where this one excels. There are a couple of archetypes and cannon fodder in the group, but they're just there to give the main characters, Barbara (O'Dea) and Ben (Jones) someone to interact with. Barbara and Ben are both tough and resourceful people, which makes what happens to them all the more heart-breaking. That's also what makes me keep revisiting the movie though, hoping each time that it'll end differently. Great review. My favorite zombie movie. Not a big fan of them, but this one just makes them so damn creepy. And the ending is so damn sad. I never thought about the differences or the lack of make up. I just assumed it was because of the period and budget. Love the write up. You never fail to keep my interest peaked.